The tormented soul that is Eminem is a character that has captured our attention more than any other mainstream music artist. A raconteur for the millennium, Marshall Mathers has produced prescriptions for the most melancholy and angst-filled teenagers of our generation, through his homophobic rants, racial slurs and suicidal visuals of course. As unsettling as it may sound, controversy has propelled Eminem to the heights of super stardom. Returning from a four-year absence, audiences will find themselves revisiting the Slim Shady formula. We have the spoof lead single that provides mere comic relief, then onto the mentally sadistic record, which flirts with the boundaries of sanity and delusional chimera, and finally the somber self-depiction track that reminds us of the talents that Eminem bestows. Four albums deep, Relapse looks to redefine controversy, but undeniably fails in its attempt and atrociously disgusts us with nothing more than prosaic fodder. The singsongy “Rock Star” again sticks to the Slim Shady matrix, but presents an obnoxious flow that is unflattering (throughout the entire album). To say the least, it’s just as gaudy as the celeb reality programs he mocks in his music video. “Bagpipes from Baghdad” is utter child’s play, as Eminem jealously spazzes on his former fling Mariah Carey and her tool husband Nick Cannon, showing bitterness is one of his most observant traits. From tasteless to immoral, Relapse becomes more disturbingly morbid than a Rob Zombie film. “Insane” manifests the heinous act of child molestation that is odious to the core. Any elaboration is deemed unnecessary. Dr. Dre’s monstrous production on “Medicine Ball” resurrects the Eminem that we’ve been waiting to hear, as his lyrical vibrancy produces an entrancing aura through your headphones. Then he goes beyond the point of absurdity by vilifying the deceased Christopher Reeves—your just left speechless. That’s until Eminem’s manager Paul Rosenberg speaks what we’re all thinking on “Paul Skit”, “You gotta be f*cking kidding me. This Christopher Reeves sh*it (awkward silence)…you know the guy’s dead right”? Em’s mother continues to be the catalyst for his personal problems and “My Mom” serves as an excuse to follow the same blueprint rather than accept responsibility for one’s own actions. By this point we tell ourselves: “We know already, your mother’s no day at the beach, and neither is her son.” The prescription junkie present on “Déjà Vu” clamors for sympathy and receives the silent treatment through its humdrum production and repetitious content. Eminem manages to find some ounce of strength to pull his stuff together and begins his rehab stint, as his collaboration with Dre on “Old Times Sakes” becomes one of the three plausible records on the album. Dre’s signature piano stabs and the duo’s chemistry lure you into treatment. As the album draws near its conclusion, “Underground” proves every junkie is given a second shot at self-redemption. You get the feeling back that there is hope going into Relapse 2 (which is scheduled for a late ’09 release). 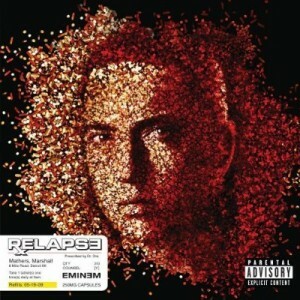 Relapse brushes off the insignificant heap of swagger that the Aftermath imprint has going and destroys Eminem’s credibility as both a talented rapper and creative musician. Em’s experimental rhyme style is absolutely intolerable and the album’s morbid content is just blown out of proportion, making him look like a nescient twit. Dr. Dre continues to reproduce the same lackluster production that’s been ridiculously hyped since his Detox announcement and should undeniably take half of the blame for this calamity. Need I say more? Beer Pairing: I suggest you drink Delirium. You literally need to drink yourself to the point of comatose in order to find any enjoyment value from this disaster.